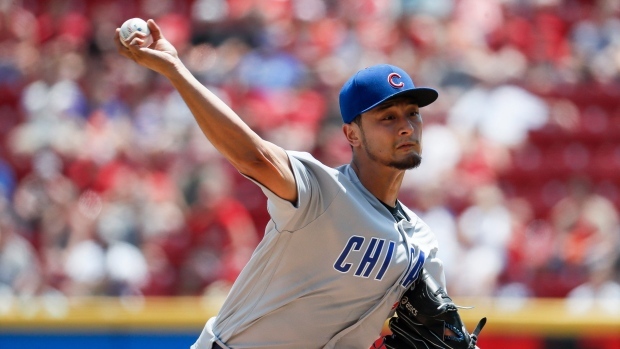 CINCINNATI — More than seven weeks into the season, Yu Darvish finally has his first win for the Chicago Cubs. Darvish recovered from a shaky start and Kyle Schwarber hit one of Chicago's three home runs Sunday in a 6-1 victory over the Cincinnati Reds. Schwarber, Javier Baez and Ben Zobrist dusted off their power strokes after each of them had gone a while without a home run. Schwarber launched a two-run drive and Baez and Zobrist each added a solo shot to help the Cubs take three of four in the series. Darvish (1-3) went six innings and allowed only two hits, both in the first, during his eighth start since signing a $126 million, six-year contract with Chicago last off-season. "He had really good stuff," Cubs manager Joe Maddon said. "After the first inning, he was commanding his fastball. He was dotting them up at 95-96 (mph), and when he can do that, it makes his slider one of the best pitches in baseball." In his second outing since coming off the disabled list Tuesday, the four-time All-Star overcame a 39-pitch first inning and finished six for the third time this season. He allowed one run with three walks and seven strikeouts. "My fastball was really good," Darvish said through a translator. "I was able to throw them in the strike zone, and (the Reds) were pretty aggressive." Tyler Mahle gave up all three Chicago long balls, passing Homer Bailey for the team lead in homers allowed with 13. The Cubs reached Mahle (3-6) for seven hits, two walks and four runs. He struck out six. "If you don't throw good pitches to anybody, you're not going to have a good start," the rookie said. "All the home runs were on pitches that weren't located well. Anything slower, they are going to see it. When they're left over the plate, that's never good." Chicago outscored the Reds 16-1 over the final two games of the series while completing a 4-2 road trip. The Reds are 2-5 since sweeping the Dodgers in a four-game series at Los Angeles for the first time since August 1976. "It was great to come out here and swing the bats well and have the pitchers do what they did," said Schwarber, ejected by plate umpire John Tumpane for saying something after taking a called third strike to end the seventh. "The Reds played good out there (in California). We knew that coming in." The Reds scored their only run on Scott Schebler's bases-loaded infield single with two outs in the first. Cubs shortstop Addison Russell went deep into the hole to backhand the ball, but he couldn't hang onto it. Darvish retired the following eight batters and nine of the next 10. "Darvish was throwing some off-speed stuff and this and that," Reds interim manager Jim Riggleman said. "All of a sudden, he decided to throw some hard stuff in an area up around the chest that was very hard to hit and very hard to lay off of." Schwarber, who grew up and went to high school 30 miles north of Cincinnati, gave the Cubs a 2-1 lead in the second with his first home run since April 26. Baez, who went into the game leading the National League with 37 RBIs, followed with his first since May 7. Zobrist led off the fifth with his second homer of the season and first since April 8. The Cubs capitalized on first baseman Joey Votto's throwing error to add two unearned runs in the seventh. Schwarber and Baez gave Chicago its first set of back-to-back homers this season. After the Reds and Cubs meet in a four-game series June 21-24 at Great American Ball Park, the teams will have completed their season series in Cincinnati while still waiting to play their first game in Chicago. Baez ranged behind second base to make a sliding grab of Votto's fifth-inning grounder, tagged the bag with his glove to force Alex Blandino and popped up to throw out Votto and complete the inning-ending double play . An intentional walk to Ian Happ in the ninth was the 30th walk issued by Reds pitchers in the series, a franchise record for a four-game set. Cubs: 3B Kris Bryant was sore after sliding hard into bases a couple of times during Saturday's doubleheader. Happ started at third base. Reds: RHP Michael Lorenzen (right shoulder strain) was scheduled to throw two innings of relief in his third rehab appearance for Double-A Pensacola. Cubs: RHP Tyler Chatwood (3-3) starts Tuesday night at home against Cleveland in a rematch of the 2016 World Series. Chatwood is 1-1 with a save and a 2.70 ERA in four career appearances, including three starts, vs. the Indians. Reds: RHP Matt Harvey (0-2) makes his home debut for Cincinnati in Tuesday's series opener against Pittsburgh.